This is Royal Artillery stable belt is manufactured to the RA specification with quality design and materials. It comes with adjustable nickel side slides and double leather double leather straps at the front for final adjustment. This belt is made for TACTICAL SUPPLIES and adheres to the strict code of manufacture and using the correct colours to the belt. Sizes: Standard width 7.5 cm; small up to 32 inch. Medium 33 to 37 inch. large 38 inch to 42 inch. XLarge 43 to 49 inch. We do discounts on these belts for larger quantities. This is a superb and great quality stable belt in the RA colours with a double tan leather straps. The side adjuster and buckles are all made to strict specifications. These belts comes 4 sizes up to a size 50 so there is a good change to get one to fit you. The fabric is a tough polypropylene weave which will hold it colour.This is a top of the range neat looking belt.This type of belt became popular with the Army at the start of the 20th century, but was in use long before that.It was used by cavalry in the stables so it was called a stable belt.In the 1900's or there about s it became popular with officers to wear coloured ties. This led to the colours being used in stable belts.This Royal Artillery stable belt made to the correct specifications with top quality materials. It has an adjustable double leather strap that will give the final fine tuning for size, buckle, nickel plates adjuster at side. 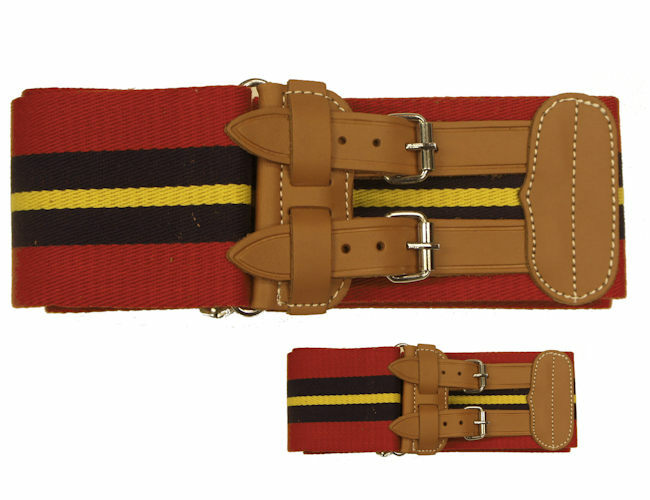 The belts is made with durable quality weave that is in the regiment colours.